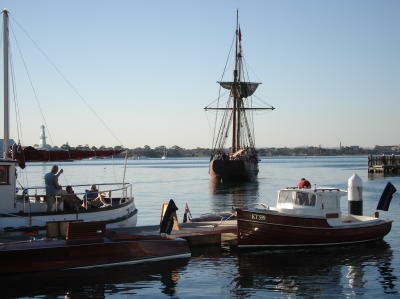 After the very successful first Geelong Wooden Boat Festival in 2005 the crew were keen to join the festivities planned for this now recognized weekend of wooden boating, food, wine and music. Both Toonalook and Rosita were towed to Geelong and launched on Saturday allowing us to roar around Corio Bay looking at the classic yacht fleet as they completed the passage race to Geelong. A warm welcome and an evening of music and dancing was to follow. So too was the catching up with old friends and making some new. A cool change at 0400 Sunday heralded an overcast and windy day. The sail past was postponed only long enough for everyone to decide that it really wasn?t that bad. A great sail and spectacle was enjoyed by all in the brisk conditions. There followed a couple of boat races before more good times ashore with a jazz band setting the pace. The presentation dinner that evening was well attended and Wayne Parrs talk on wooden boat building and restoration was evocative. So too was the Longboard shiraz consumed in great quantities. Well organized and plain good fun we have decided that this festival is well worth supporting. See you there next year.